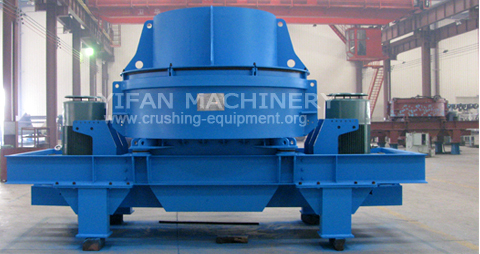 Sand Maker - Vertical Shaft Impact Crusher(VSI Crusher), it have another name called sand making machine. Sand maker is high-performance equipment for sand making and shaping, is researched and produced by our corporation through absorbing the advanced technology from Germany, and has achieved world advanced standards. This equipment has two types: rock-on-rock and rock-on-iron. Sand yield of “rock-on-iron” type is higher by 10-20% than that of “rock-on-rock” type. 3、It has fine crush and coarse grinding function. 4、It is little affected by the moisture content, and the content can get up to about 8%. 5、It is suitable to crush midium hard, hard special materials. 6、Excellent product of cubic shape, and small fraction of elongated flaky particle shape. 7、Small wear from Impeller liner, and easy maintenance. 8、Working Noise is lower than 75 decibel, dust pollution. 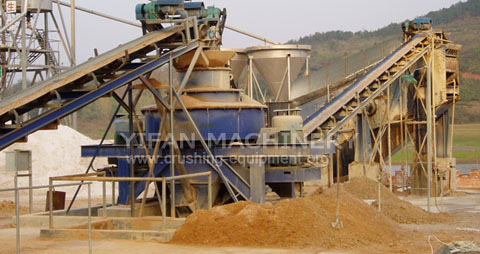 4.It is used for producing glass raw material and quartz sand ect. 1. Simple and reasonable structure, lost running cost. 1. The capacity is total tons per hour passing through crusher at open circuit when crushing mid-hard material and loose density with 1.6×103kg/m3. Capacities are relative to physical character and type of feeding, feeding size and composition and so on. 2. The number inside brackets is applicable to low corrosive material.